In my previous post, I tried to answer a few questions that push us into buying high-growth promising packaged drinks for our children. One such drink that has gained immense popularity in India is Pediasure. The brand promise is that it has 37 nutrients to help support height and weight gain, immunity and brain development. Given the increasing demand for Pediasure, how can an established brand like Horlicks stay far behind? 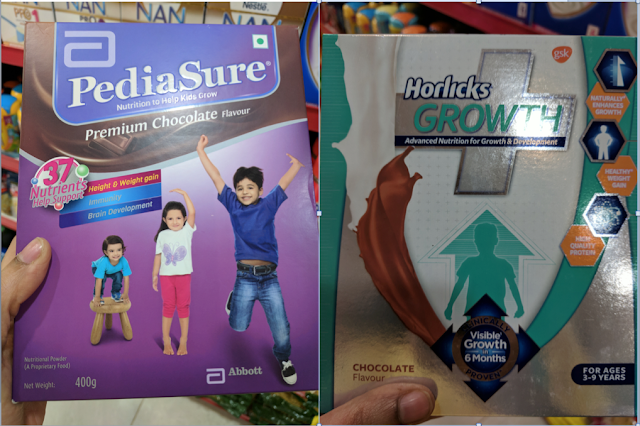 Along with their Junior Horlicks variants targeted towards kids <4 years old, a new brand named Horlicks Growth+ has been recently launched for 3-9 year old kids. I’m sure in a few years, they will come up with a new variant for teenagers too, thus covering all age brackets. 1. First and foremost, the longer the ingredients list is, the more cautious we need to be. 2. “Flavoring” is listed in the ingredients list without any detail. For this chocolate flavour pack, cocoa powder is already listed. What more flavour is needed? 3. Medium chain triglycerides (MCT) are a type of fats that are easier to digest and provide instant energy for the body. MCTs are found abundantly in coconut oil and palm kernel oil. They are also found in dairy products. MCT oils are synthetically produced through a process called fractionation. These man-made oils have become so popular these days, thanks to Ketogenic diet. Should we let the body decide how to extract MCTs from natural sources OR do we feed the body with artificial MCTs? 4. Fructo-oligosaccharides (FOS) => they are used as alternative sweeteners and are extracted from plant-based sources. FOS is also used as a pre-biotic. If FOS intake exceeds 10 gms per day, it can result in intestinal flatulence, bloating, stomach cramps and diarrhoea. It is allowed in restricted amounts in infant and baby formula products in EU. Canadian regulations have not approved the use of FOS in baby formula foods. I’m extremely skeptical about synthetic vitamins and minerals being directly consumed in the form of supplements and pills. How much of such artificial nutrients actually get absorbed is a question that we need to ask these brands promising “X nutrients” in their pack. Our human digestive system is efficient, complex and designed to break down food and absorb nutrients in a series of steps. Aren’t we by-passing the entire sequence by direct consumption of minerals and vitamins? Won’t this make our digestive system sluggish and weak? “Luxury once sampled becomes a necessity”. This quote is so relevant for our health too. Once we start popping a pain killer for every minor ailment, we lose the ability to withstand pain. Similarly, once we take such artificial supplements, our bodies lose their ability to use digestive enzymes and break down nutrients from the foods we consume. Inositol is used for treating various medical conditions such as OCD (Obsessive Compulsive disorder), PCOD (polycystic ovarian disease), panic disorder, psoriasis etc. What’s the need for such an ingredient in a child’s growth drink, I wonder. One of the side-effects of high inositol consumption (and taurine listed below) is that it increases complications of bipolar disorder. Taurine is a “conditionally essential" amino-acid. Our body can produce taurine and it is also found in some foods such as meat, fish and dairy. Since it's a "conditionally essential" amino acid, a healthy individual can produce the minimal amount required for these essential daily functions. However, higher amounts may be required in rare cases, making it an "essential" nutrient for some people. This includes people with heart or kidney failure, or premature infants that have been fed intravenously for a long time. Taurine supplements might be effective for people with diabetes and heart conditions. And it is also usually consumed by athletes to improve their performance. This could be one of the possible reasons why kids who drink Pediasure put on weight. But again, it is an artificial supplement and I question the need for it. Probiotic bacteria that maintains our gut health. Lactobacillus found abundantly in curd and fermented foods. The reasons I spoke about in my earlier post on Yakult are applicable here as well. A naturally occurring amino-acid derivative. Our body produces it using the amino acids lysine and methionine. It helps in the production of energy by transporting fatty acids into our cells’ mitochondria. It helps to reverse the decline in brain function associated with Alzheimer's and other brain diseases associated with ageing. It is also prescribed as a weight-loss supplement. Let’s quickly talk about the newly launched Horlicks Growth+. The brand’s promise sounds similar to that of Pediasure - enhances growth, healthy weight gain and high quality protein. 1. When I see a list of ingredients that have stabilizer, antioxidants, emulsifiers and acidity regulator, I immediately put the product into the “junk” category bucket. 2. Where did we last see about caramel colour INS 150(d)? Yes, Kelloggs Chocos. Check out my earlier post to know more about this colour and its side effects. 3. “Arginine” - a “semi-essential amino acid" is added to this drink formulation. Arginine is naturally available in rice, various pulses and lentils that we use commonly in our country. Drumstick, fresh green peas, raisins, watermelon, garlic and onions are rich in arginine. If you eat a well-balanced diet, then supplements are not needed. 4. In both these drinks, the top 3 ingredients are milk solids, sugar and edible fat. The high growth promised by these brands comes from these three unhealthy ingredients, resulting in obesity, premature puberty and other lifestyle diseases at a young age. The long list of other artificial amino-acids, vitamins and minerals are just a sham to fool us into believing that we are giving our kids a healthy drink. The analysis of these ingredients, their functions and their usage makes me think whether we have totally dismissed the capabilities of our kids’ digestive system that we need so many artificial amino-acids, vitamins and minerals. Either that or we are too busy with our own lives, that we resort to quick-fix solutions like these drinks for our kids. i stumbled on your blog today Anuradha and it is fantastic. i love the detail in which you break down your article and how you explain each and every ingredient and its importance. Why we should stay away from olive oil?